View a one minute demo of SnapshotCM in action. We suggest viewing in HD quality. SnapshotCM Team Development enables you and your team members to integrate new features and publish completed features on a schedule that works for each of you. By providing the framework for integrating and publishing new features, you and your team can focus on your individual tasks and work in a stable environment with all the version control features available to you. Yet when ready, you can quickly integrate team-wide changes and publish your changes to the whole team. 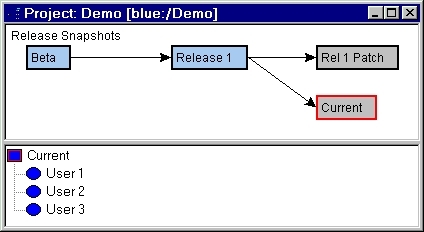 In SnapshotCM, team development is coordinated through a development hierarchy of snapshots below each release snapshot. A development hierarchy provides a structured method to balance the desires of developers to work in a stable environment, and the need for completed changes to be published to all users. 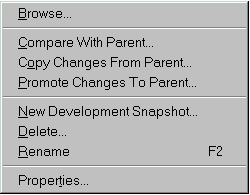 At right, the development hierarchy consists of the three User snapshots under the Current release snapshot. In this simple model, each user has a private snapshot to operate in while they are working on a feature. Once completed, they can integrate changes from Current into their snapshot, complete their testing, and then promote their changes to Current, making their changes available for other users to integrate. The development hierarchy allows for much flexibility and is optional. The simplest approach has all users attaching their workspaces directly to a release snapshot without using the development hierarchy. Another approach is the team snapshot approach show at left. Users attach workspaces to team snapshots, and each team integrates and promotes their changes when ready. The introduction of an Integration snapshot, shown at left lower, between the team and release snapshots allows for keeping Current more stable (only stable and tested versions of Integration are promoted). In addition, we see here a mixed use model. Team 1 is operating with its users having personal snapshots, while teams 2 and 3 are operating with one snapshot each. The pop up menu for development snapshots is shown at right. Just as with the release graph, the integrate and publish operations (copy and promote), as well as the compare operation and others, are performed directly upon the development hierarchy. SnapshotCM provides a flexible structure for coordinating the efforts of individuals within a team, as well as teams within an organization. Combine this development team flexibility with the unbeatable snapshot performance and clear graphical versioning, and you have three great reasons to adopt SnapshotCM. But there are more. Prove it to yourself by downloading your free, non-expiring copy today.